The event was sponsored by the British Council with the aim to encourage research collaboration among the young, talented and ambitious researchers from the UK and Indonesia. 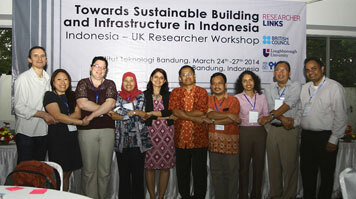 Participants were selected on the basis of their research potential and ability to build long-term collaboration links. This year's workshop ran over an intensive four-day itinerary between 24-27 March and included delegates representing leading UK universities. Jennifer Hardi, Senior Lecturer in Architectural Technology was invited to participate in this highly sought after workshop due to her professional influence, extensive work and knowledge on sustainability within the construction industry arena. Jennifer's research interest includes architecture design technology, environmental assessment method, BIM (Building Information Modelling), life cycle assessment, sustainable urban planning, and energy efficiency in buildings. The main topics identified during the workshop activities included: the need for tropical built environment performance indices; monitoring of infrastructure suitable for the climate; quantifying emissions from construction activities; and low-cost energy efficient housing. Jennifer was appointed to lead the tropical built environment performance indices research topic. The research aim is to assess and develop suitable tropical built environment performance indices for Indonesia, and to apply these indices to improve local government's performance evaluation in the delivery of sustainable built environment. The first phase of this research reviews the existing methods and its indices to identify transferable good practice. The second is to assess and highlight the key performance indicators that most fit Indonesian context. The workshop has also led to the establishment of UKIREN (UK-Indonesia Researchers Network) website where Jennifer is a founding member.